Barker House Concerts - What's a House Concert? Paul Barker extends this offer about once a month, allowing up to eighty friends and strangers into hisWestlake Hills home to share in his passion for live music. Known as a house concert, the event represents the culmination of months of work, a labor of love Barker has become addicted to over the last seven years. Those fortunate few who have discovered house concerts, particularly Barker house concerts, are continually amazed at the quality of music produced by the singer-songwriters that wander the country, living room by living room. The touring artists, in turn, are rewarded with significantly better paychecks than most clubs offer and with an attentive, respectful audience that soaks up every introspective passage delivered. The marriage of Barker and house concerts was made in heaven. For Barker, whose self-professed passion is to discover and develop emerging musicians, the concert booking is a form of support that can be significant in gaining name recognition for the artist. House concert patrons tend to be loyal, especially to a well-known host such as Barker, trusting completely in his ability to produce a quality act. Barker uses this well deserved reputation to showcase his emerging artist discoveries. “Ninety percent of my audience has never heard of the artist I bring in,” he says. Luck is not involved. Barker travels regularly, at times as far as Vancouver, to songwriter cradles such as the Kerrville New Folk Festival and the Folk Alliance, booking his acts usually only after hearing and seeing the artist perform. A demo CD will probably not do the trick, a fact reinforced by the perennial stack on his fireplace hearth, some not yet played, many destined to become door prizes. Before realizing they were house concerts, Barker, 57, was simply adding musical acts to his parties. Eventually, the music became the main event. Today, Barker, who is the Westlake Hills fire chief, is involved in a variety of booking endeavors that continually expose him to emerging artists. During South by Southwest he books a six-day showcase of thirty musicians at Artz Rib House, plus another fifty there throughout the year. He hosts a fall showcase of twenty-four artists for the Southwest Regional Folk Alliance and has helped the Wild Basin Development Director, Georganne Foster, create a new monthly concert series. For the Wild Basin concerts, he finds the talent, helps promote the events through his established mailing list, and often hosts the artists while they are in town. A newcomer to a Barker concert is immediately put at ease by the well-orchestrated chaos that precedes each event. While some patrons jockey for prime seats in the large living room, others contribute to or raid the potluck food table, clogging the galley kitchen as they catch up on the lives of friends seen only at these concerts. The musicians can be identified as they make last minute preparations to the ill-defined stage area, adjusting the sound system or displaying product. Somewhere in the swelling crowd, Barker is sure to be prominent, if not by his stature by his signature Hawaiian shirt. As starting time approaches he slides towards the stage, a subtle hint ignored by most until he begins his opening remarks. At times he resorts to his Tibetan singing bowl, rubbing it gently until its low-pitched tone builds, absorbing all other sounds. The show is about to begin. Regulars also feel at home here, seeing familiar faces everywhere. New faces dotting the crowd have a look of expectancy that is infectious. The food is predictably excellent and the atmosphere is filled with anticipation. Although the content promises to be fresh and spontaneous, each concert is run in a comfortably consistent fashion. As Barker goes over the house rules, embedded in traditional jokes that, if omitted, would be missed, the room quiets. There will be an opening set, followed by two feature sets, with ten-minute intermissions. Smoking is restricted to the “pre-carcinoma” area, as Barker refers to his outside deck and fire pit, and the bathrooms are the “rooms without beds.” In a show of respect for the artists, movement is restricted to between songs, as is entry to the house. One element notably missing is any overt sign of money collection. With a bit of effort the wicker donation basket can be found on the kitchen counter, almost hidden amidst assorted containers and bottles. Mentioned only in passing, the ten-dollar suggested donation goes entirely to the artists. Consistent with the house concert concept, all costs of hosting the concert are absorbed by Barker. Only the artists are doing business tonight, an important distinction that keeps house concerts such as Barker’s from treading on zoning restrictions and other legalities. And a lucrative business it can be. As noted by booking agent and Barker house concert patron Steve Blank, “It’s a very good evening. It’s what we call an anchor gig. On a Saturday night, if you can get a house concert, you try to fill in the rest of the week around that house concert.” In some cases the deal includes a bed for the night, assuming the artist is willing to snuggle up with Tina and Jenny, Barker’s two Great Danes. Many are. 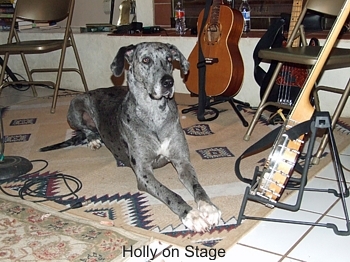 Having the run of the house, the Great Danes and Maggie, a German-Australian Shepherd, often become part of the evening’s entertainment as they saunter across the stage, passing judgment on delicately presented love songs. Tina especially seems oblivious to the crowd as she makes for her favorite leather couch, showing obvious annoyance if the prime front row spot is occupied. Once comfortably curled up there, her occasional snoring can break the concentration of the most heckle-hardened performer. The artist adapts while the audience, enjoying every wry expression, explodes in laughter. Tina remains unaffected. The musical tales spun during house concerts range from soft love songs to comedic nonsense, from toe tapping road songs to dark ballads, many laced with social commentary. These singer-songwriters invariably have something to say and relish each opportunity to perform. The acts are usually acoustic and rarely larger than two artists, the format not being conducive to large groups. Not uncommon, however, are cameo appearances by other performers. House concert audiences often contain singer-songwriters who, to the crowd’s delight, suddenly find themselves harmonizing with the featured artist, adding yet another dimension to the house concert experience. At one recent Barker concert, Tom Kimmel emerged from the audience, blending his voice with Tom Prasada Rao’s to deliver a moving song they had co-written. Not yet household names outside house concert circles, the two friends are representative of talent that is waiting at fame’s door, just as Terri Hendrix was when she appeared at a Barker concert five years ago. “When your kids have your estate sale they’ll get fifty cents more for the CD,” Barker quips, encouraging patrons to request autographed product before the artist becomes famous. As the evening and second set wind down, the final round of applause shows appreciation for both the music and for Barker’s dedication and perseverance in making the concert possible. Barker regular Mike Landrus agreed. “Paul Barker is doing a wonderful service,” he said, expressing the thought of many in the room. With the food table thoroughly scavenged, the patrons fold chairs, close coolers, and exit stage left, into the darkness of the secluded cul-de-sac that borders the Wild Basin Preserve. It took roughly eight-hours to set up for the concert. Clean up will take four more. Everyone, most of all Paul Barker, agrees it was time well spent.